Susan, a Presbyterian minister, presides as Blanchard (left) and Charlie Goetz plight their troth. My Blanchard’s personal totem includes Raven. I am, by default, Eagle. The rings were designed by Amos Wallace, “noted Tlingit Carver and member of the Raven clan.” Wallace started carving in 1938 when he was 18 years old. He plied his art until his death in 2004. 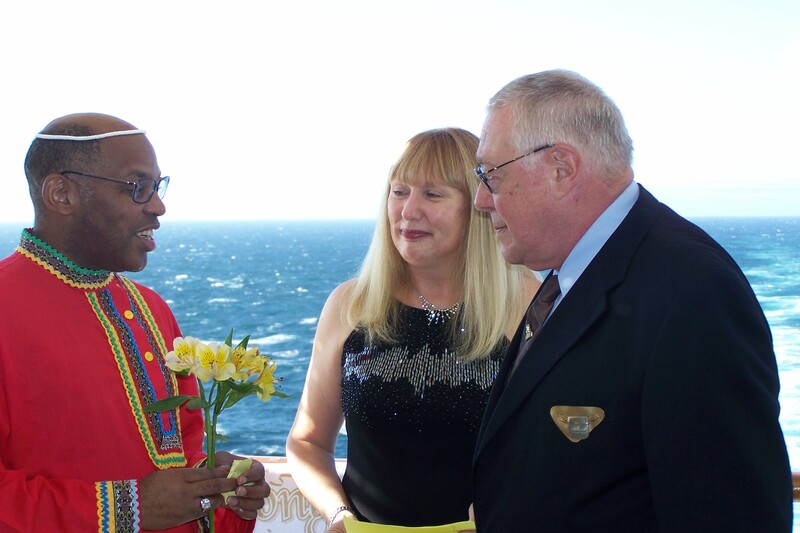 We wanted to exchange rings and vows aboard our Alaska cruise ship. Last summer, cruising the Greek islands, we’d met Susan and Roman, seventy-something table mates in the dining room. Both widowed, they were very much in love and had formulated plans to plight their troth in the ship’s chapel. They didn’t want to “make it legal” because both had adult children, and a conventional marriage would complicate things for them financially. Our dining companions were a very convivial company, so after a few days of bonding, all were invited to witness the couple’s little ceremony. Susan is a Presbyterian minister; she knew what she was doing. Then and there, Blanchard and I decided that, because we live in Ohio, a backwater when it comes to marriage equality, we wanted to tie the knot the way Susan and Roman did. In due course, maybe visiting my New York natal place, we could add what legality might be available. Our marriage is not a political statement but a logical enhancement of our decade-and-a-half relationship. The wedding arose out of an argument the subject of which neither of us remembers. So, over a year later, we had the rings but, much to Blanchard’s dismay, our ship had no chapel – just an extra nigh club. Fortunately, one of our fellow travelers – we were cruising with a group called The Sea Angels, and angels they are – richer than the rest, had a large, rear-deck balcony. She readily lent us the space, and the Angels, dressed in their best, surrounded us with love and champagne as we exchanged vows. Francine, our guiding Angel, officiated, as she is authorized to do. It was Sept. 5. Addressing my Blanchard, I noted that he would be my third spouse, Pam, my first, and Todd, my second, having passed away. So, referring to the divine trinity I’d learned about in grade school, I called Blanchard my “Third Person,” my Holy Spirit. At 61 and 75 respectively, Blanchard and I know our story has a deadline. Just before we’d left for our Alaska adventure, Susan e-mailed us that Roman had succumbed to cancer. The disease, in remission then, had been an uninvited but acknowledged presence at their wedding. It didn’t stop them. And Roman’s passing has not diminished Susan’s love for him. Just as their wedding was a model for ours, we intend to follow the loving example they subsequently set forth. As Susan did, please wish us Godspeed. We are very happy.